Although it’s a mystery set, there are a few options for customization. I thought this was very cool because buying mystery items always comes with the risk of wasted money on a product that doesn’t fit you. The customization this product offers helps to minimize, if not completely eradicate, that risk. The downside is that I am so indecisive! For a few extra dollars, you can add a tail tip. I love tipped tails! You also have two different ear styles to choose from. There is no information showing or describing the difference between Ear Style A and Ear Style B, but from looking at other products I found that Style B is fluffier. I decided to go with A even though I usually prefer longer fur because it looked more realistic to me in the images. You can choose from Natural, Pastel, and Bright styles. Again, there is no picture or description to show the difference between the three styles, but I feel this one is pretty self explanatory. The shop does have two fur charts if you’d like to check out their collection. One chart shows their Realistic Faux Fur and the other shows off their Pastels and Bright options. Note that the mystery set will come in long pile luxury fur, regardless of your style selection, according to the product description. I chose the Pastel style. Purchasers are encouraged to let the shop know if there are colors you do NOT want your set to include within the purchase comment. I was a little bratty and offered a list of my favorite colors, because it’s easier for me to describe things I like versus things I don’t. You can choose black or silver for your headband color in the purchase comment. If you do not specify, they will choose for you. I let mine be a surprise. 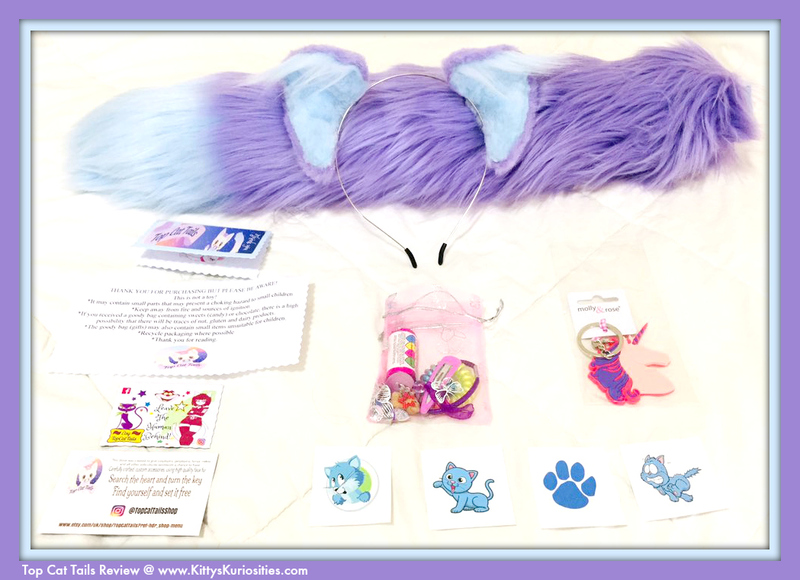 There are additional add ons you can request, including a princess chain, tail squeaker, bows, and studs. Some have a product listing that you purchase in addition to the product, while others require you to ask them directly in the purchase comment. It is not clear if those cost extra, but I tend to assume so. I did not request any add ons with my purchase. Rubber ends on the metal headbands, to prevent the headband from digging in. I’m always skeptical of this, so we’ll see how well it works! 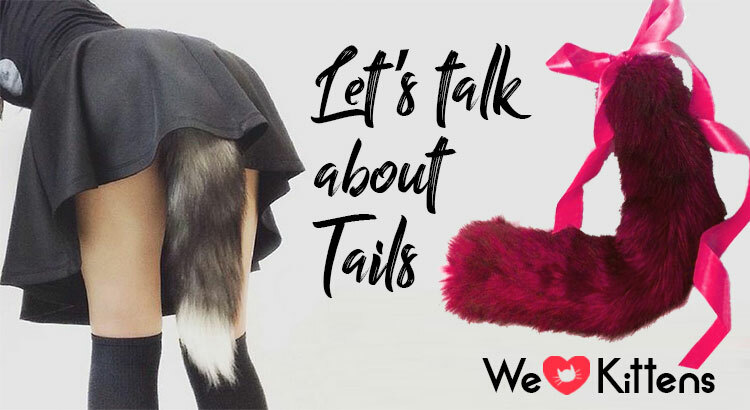 Tails are lightly stuffed, for extra movement. Discreet packaging. Items are in a waterproof bag, inside a box. Product will be tracked and require a signature, for added security and peace of mind. Let’s go! I am super stoked! The product is labeled as ready to ship in 1 to 2 weeks from the UK. The charge was $18.30, which I was not thrilled about. I don’t blame the seller for that though. International shipping is always rough. My product shipped exactly on the 2 week mark. I received it 9 days later, which was earlier than I expected! Though tracking and signing were advertised, the “Track Package” button that usually pops up on my Etsy orders never appeared, and I was not required to sign. Still, I was very pleased by the quick arrival! Okay. I should have done a video of this, but I was too excited. The package arrived in a plain box labeled for customs as “costume accessories”. There was a tracking label, so I assume tracking information could have been provided if I had contacted the seller directly, but it honestly wasn’t that important to me. Inside the box was perfect! The ears and tail were inside of a pastel pink plastic bag, and then each was further wrapped in clear plastic with little white polka dots. It looked very professional! The bottom of the box was lined in orange tissue paper. In addition to my items, the box contained my order receipt, a business card, a magnet business card, a small thank you card with a handwritten message, some stickers, a notice of various product warnings (small parts, keep away from fire, etc), and a mini goody bag with candy, a few hair accessories, and some other tiny shiny things. Some of their adorable graphics were stretched or squashed, so they could potentially benefit from working with a graphic designer, but overall I was impressed and delighted by the product packaging. The set I received is pastel purple and blue and I freaking love it. It’s perfect! The ears are wired onto a silver metal headband with removal rubber tips. The tips keep the metal from digging in, but the headband itself is on the small side and may cause discomfort long term if you’re sensitive to that (I am). The ears can be bent and posed and they are able to slide up and down on the headband. Despite this, they stay firmly in place. They do not feel loose or fragile. There are a few stitching imperfections and rough areas, but they aren’t easily noticed, especially when you’re wearing them. They look fantastic, and are easily my new favorite ears. The tail is a little stiffer than I was expecting based on the description, but the fur is incredibly soft and luxurious. I’m pretty sure it’s the softest tail I own. It came with a sewn in loop and matching blue ribbon as well as a large safety pin. The loop is not elastic, so I can’t fit it onto the belt I usually wear, but that’s okay. I can tie it on with the ribbon (and make a big dramatic bow! ), or loop it onto my other belt. The safety pin has a red end, so I probably won’t use it, but I like that it came with the option. The transition between the purple fur and the blue tip is flawless. Ultimately, the set looks and feels great. It arrived quickly and was packaged well. The items were everything I was led to expect from the product page, and I have a new favorite kitten set! Thanks a bunch, Top Cat Tails!